First of all log into your Facebook Account. Now Click on CONNECT WITH FACEBOOK. Now it will run a app , Allow the application to post. 5. Now on right side there will be drop down box. 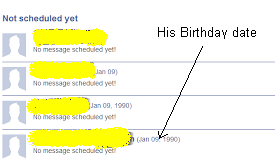 Now it will automaticaly Send birth day msg to ur friend on his Birth day date.